Key societal systems are evolving faster than ever and the question of how science and technology will be employed to shape society is one of the biggest issues facing humankind. We believe that a strong engineering profession is required to ensure that the results are positive, just, and sustainable for everyone. Although the engineering profession has already contributed much in this regard, we believe that it has a much greater potential and that it is urgent and important that we unlock this potential. 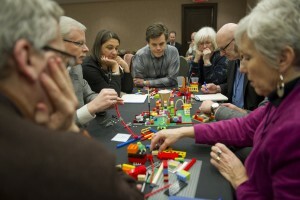 In January of 2015 at our annual conference, EWB and Engineers Canada helped launch a unique new platform for collaborative action within the profession called the Engineering Change Lab. The Lab brings together senior leaders representing organizations from across the profession (companies, universities, government agencies, associations, and nonprofits) to continually deepen a broad understanding of the higher potential of the profession, and take tangible action to unlock it. 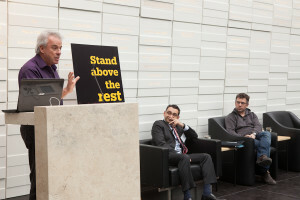 The Lab convened three times in 2015 to progress a portfolio of initiatives aimed at tackling some of profession’s most pressing problems, like low levels of innovation and lack of diversity. Taken in the aggregate, these issues and others address a key question: can engineering evolve fast enough to keep up with the rest of the world? By tackling that question, the Change Lab is building the sector’s capacity to evolve—and focusing on what engineering can do for society. EoT also celebrated the growth of Engineer-in-Residence, the flagship educational outreach program of Professional Engineers of Ontario, where a professional engineer is paired with an elementary or high school class; launched a new collaboration with Ontario Network of Women in Engineering, and worked with the Ontario Society of Professional Engineers on Engineering Success, a pilot mentorship program reaching young women to encourage them to stay in engineering. 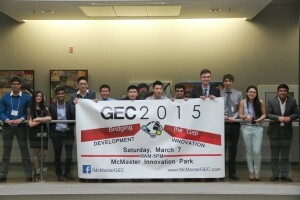 2015 was also a banner year for another EWB-supported venture in this space, the Global Engineering Initiative. At Memorial University in Newfoundland, Robert Shea and Brian Peach became the first-ever graduates of the Global Engineering Certificate. The certificate highlights university student leaders pursuing global engineering skill sets and provide recognition of their efforts upon graduation. It brings light to the wealth of GE content currently present within university curriculums, and provides students with clear pathways to a becoming global engineer. And it serves as a catalyst, providing tangible frameworks and objectives for students and faculty to collaborate on further enhancing university courses. With the certificate and other efforts, including progress on an online community, the GEI team is creating a cross-country community of global engineering students, faculty, and professionals—a community that is well-equipped to tackle the complex issues we face today. Combined, these ventures and the Lab platform are helping build significant momentum within the engineering profession in Canada. In 2016, we look forward to continuing to build this momentum and celebrating more successes.